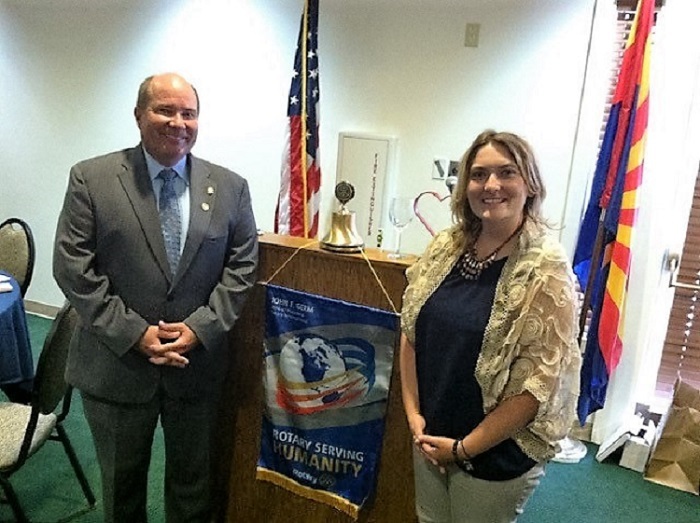 The regular noon meeting of the Rotary Club of Sierra Vista was a special event this week. Our new Club President, Mr. Joe Puett, was installed in office along with the new Officers and Directors of his team. Prior to the Installation ceremony, the Club President for 2015-16, Ms. Emily Scherrer, provided an excellent recap of the accomplishments by the club during her tenure. Emily began her Rotary year a little earlier than most, as she stepped in to be the Club President when the serving President 2014-15 transferred to Utah. Emily was up to the task and with support from her Board of Directors and the club members, she blazed a path for us to follow the entire year. With her energy and leadership, the club completed dictionary and thesaurus deliveries to 3rd grade and 7th grade students in Cochise County. Club members supported the Douglas Fly-In and the Sierra Vista Fly-In; participated in the Alzheimer’s Walk and the Relay for Life; participated in a record breaking manner in the Ride to End Polio conducted in conjunction with the El Tour de Tucson; sent an exchange student to Taiwan and sponsored a young French high school student here in Sierra Vista. We also sent two of our club members to Mexico to immunize children from polio. The club started having regular “Happy Hour” gatherings open to all Rotarians and prospective Rotarians, intended to strengthen our social ties in the club and within the community, which they did. These gatherings were a big hit and will continue into the next Rotary Year. Another significant accomplishment of the club under the Presidency of Ms. Scherrer, was being at the very top level of contributions per/capita for the Rotary Foundation, thereby helping to provide aid and assistance around the world in international humanitarian and peace-making efforts. “It is now my pleasant duty to pass on the baton of leadership of this prestigious club to our incoming president, Joe Puett. He is energetic, full of ideas, and ready to lead. I know his year will be a success and I'm already looking forward to serving him (and handing over my duties) as our leader. I wish Joe and his incoming board every success. ‘You're off to Great Places! Ms. Scherrer then recognized her 2015-16 Board of Directors with presents: Rotary wine glasses went to Vice President - Frank Gonzalez; Secretary - Mike Strange; Treasurer - Jack Lintner; Sgt-at-Arms - Les Orchekowsky; Community Service Director - Brian Barkdull; Vocational Service Director - Joe Britton; Public Relations Director - Al Chariton; International Director - Jim Evans; New Generations/Youth Services Director - Anne Gibson; and Rotary Foundation Director - Les Orchekowsky. Emily then announced attendance awards, and gave special thank you presents to Rotarians who provided exceptional support to Rotary projects. Emily ending up by presenting her two highest annual awards; The “Rotarian of the Year Award” was given to Rotarian Jack Lintner, and the “Service Above Self Award” was given to Rotarian John Spengler. 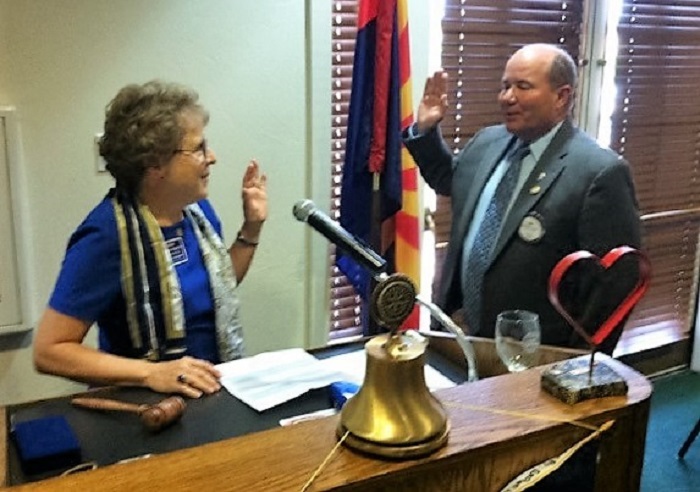 Past President and Rotary District 5500 Assistant Governor, Ms. KJ Wigton, then conducted the Installation ‘Swearing- In’ ceremony for new Club President Joe Puett. After taking the President’s gavel, President Joe took charge of the rest of the meeting starting with the official ‘swearing-in’ of his new Board of Directors.